The Expanded Core Curriculum for Deaf/Hard of Hearing are those skills that students need to learn in order to fully participate in and benefit from the general curriculum. Increasingly, students with hearing loss are the only ones in their grade/school that use hearing devices.It is to the student’s benefit to be his own ‘technology specialist’ and able to monitor/troubleshoot/report when issues occur as they can arise at any time throughout the school day, not just when the teacher may have the time to monitor hearing aid function. Because hearing aids can malfunction anytime, it is only the student who can verify he is receiving his typical level of access to classroom communication throughout the day. US Law has made the school responsible for ensuring that hearing devices worn by children who are deaf or hard of hearing are functioning properly. Since only the child (if trained) can identify when issues occur, to truly make certain that devices are working, schools must ensure that children have the skills they need to be able to accurately self-monitor and report arising issues. 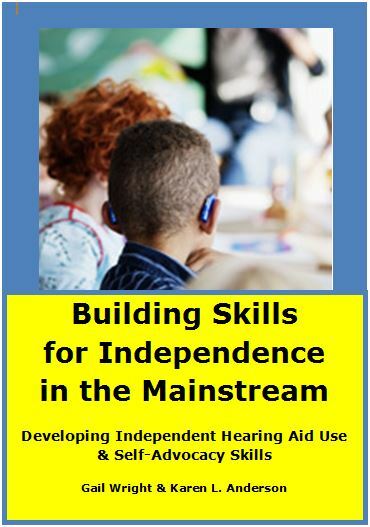 Building Skills for Independence in the Mainstream was developed as a Guide for DHH professionals to support their work with classroom teachers and with students to develop the skills needed for independence with hearing aids and self-advocacy. In 2011 the Student Expectations for Advocacy & Monitoring (SEAM) was created as a hierarchy of skill development. Similarly, in 2012, the Guide to Self-Advocacy Skill Development hierarchy was created. Building Skills for Independence in the Mainstream is an outgrowth of a simple discussion about just how a DHH professional would go about teaching these skills and working with the classroom teacher to support student independence and self-advocacy. It has been exciting to team up with the creative and very experienced Gail Wright to develop this extensive Guide!Over 50% of the pages inBuilding Skills for Independence in theMainstreamare colorful with engaging and thought-provoking images and activities to discuss with your students. Spiral bound, it is designed to be used as a center-piece for your discussions and skill-building practice. Review the 7 sections that comprise the Guide in the Table of Contents listed below. The 50 downloadable files allow students to take information home, they can be given to classroom teachers, posted on classroom walls as a reminder, and of course a number of the materials are provided for data collection. I really think that this material will help support new and veteran DHH professionals alike in their work with classroom teachers to facilitate the independence of students with hearing loss! Test, Test, Test – My Turn to Check! PowerPoint Presentation for Classroom: How Do We Learn Things? How Do You Know When a Communication Breakdown Has Happened? Self-Advocacy Strategies – What Can You Do? Self-Advocacy Tools – Which Tools Do You Use? Which of These Caused Your Listening or Understanding Problem? Which Communication Breakdowns have YOU experienced?